Students Phoebe Drioli-Phillips (Health Sciences, left picture below) and Jana Le (Psychology, right picture below) took a fresh look at data collected on South Australian men’s attitudes towards the concept of a dedicated men’s health service (DMHS) as part of the 2014-15 summer vacation research program. Their results were presented at the June 2015 South Australian Men’s Health Research Symposium. a DMHS may not address the delayed use of health services by men due to perceived barriers suggesting other strategies are needed to encourage timely uptake. If a DMHS was to be developed, it should target younger and employed men as they would be more likely to attend a DMHS than older, sick, retired or unemployed men. 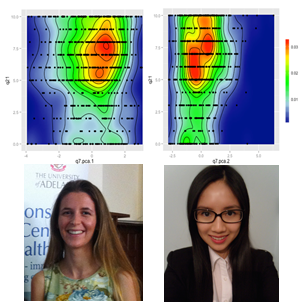 Phoebe and Jana used a technique called principal component analyses (heat map below) of participant responses to categorise men by health help seeking and health monitoring behavior. From this they concluded that a DMHS targeting working age men, who are motivated to improve their health, and thus show health information seeking behaviours, may be viable. Students interested in health services research for an Honours/Masters or PhD degree may contact the Centre at menshealth@adelaide.edu.au. This entry was posted in News, Research and tagged health services, men's health, summer vacation research, utilisation. Bookmark the permalink.